You are a MechWarrior, an elite fighter trained to control the ultimate war machine of the 32nd century. Wield massive destructive power as you comandeer 20+ vehicles including Mechs, Tanks, Turrets and BattleArmor. 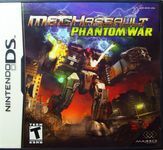 The thrilling intergalactic combat of the renowned MechAssault series is now in the palm of your hand!